The Macho 120 Revision A is the compact version of the legendary HR-02 Macho making it one of Thermalright's most sought after quiet coolers. The design of Macho 120 Rev.A heatsink basically matches that of the bigger HR-02 Macho. Measuring 120 x 130 x 150 mm (L x W x H) the Macho 120 is more compact version of its bigger brother. Therefore the 120mm Macho is ideal for the users looking for a very quiet CPU cooler where space is at a premium. It features a very quiet 120mm fan and five nickel plated heatpipes which disperse the heat away from the CPU. 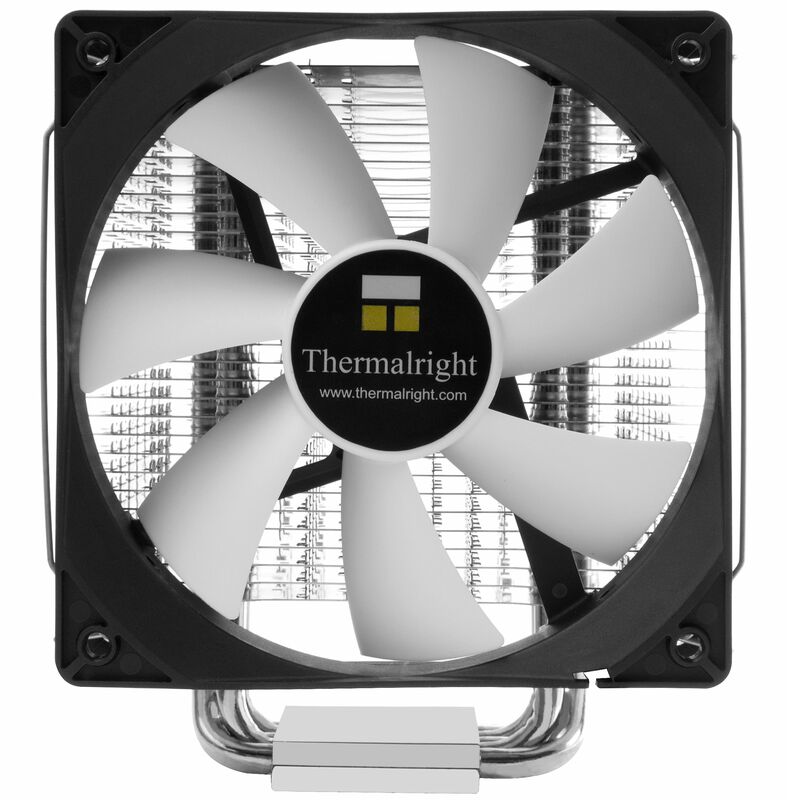 In the Revision A the cooler is part of the most recent, high-quality implementation of the redesigned of Thermalright's "Value" Series. The copper heatpipes now are nickel-plated and offer in combination with the black anodised top-fin a very elegant appearance, probably unique in a cooler in this price range. Thermalright combines high-quality optics of a high-priced, high-end CPU cooler with the award-winning characteristics and an outstanding price to performance ratio. 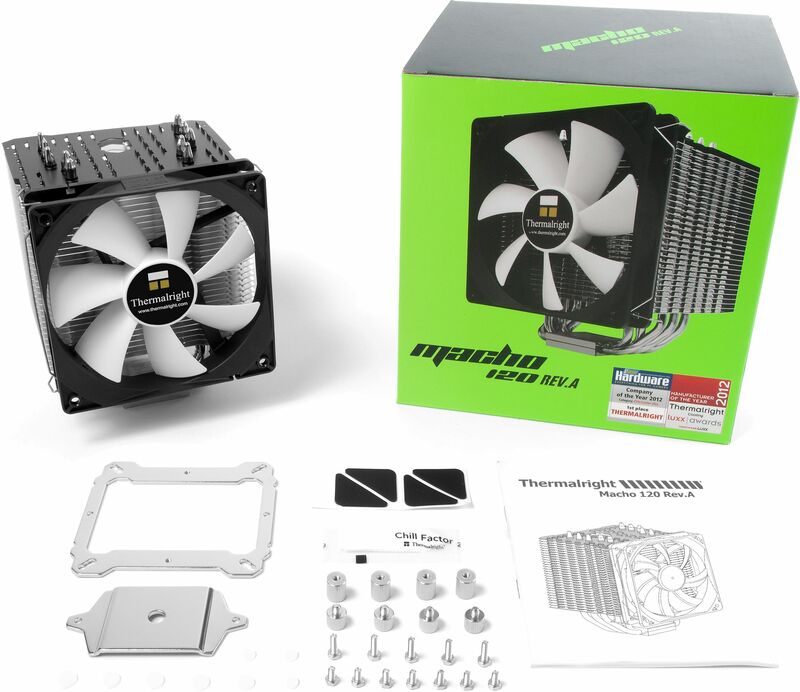 The outstanding cooling performance of the Macho 120 Rev.A is based on the innovative design of the 30 cooling fins in combination with the use of five high-end 6mm heatpipes. The cooling fins are perforated by a plethora of air holes, which counteract air accumulation between the cooling fins and guarantee optimal air exchange. An oval air duct in the middle of the cooler provides controlled air turbulence within the heat sink, whereby the heat can be dissipated more effectively. 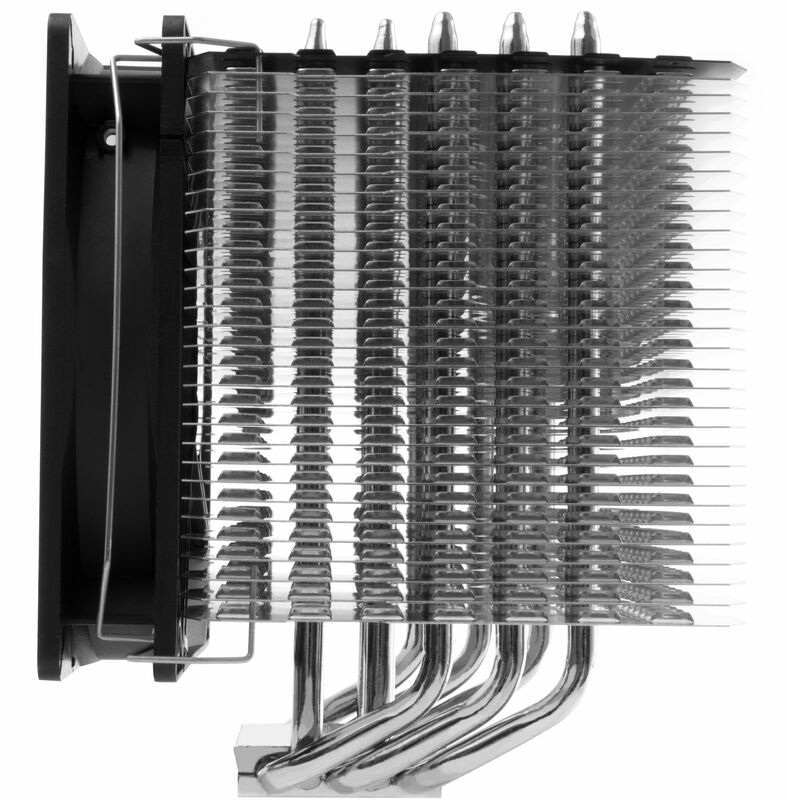 The special design of the heatsink aluminium fins allows for a particularly low air resistance that has been optimised for low-rpm fans. 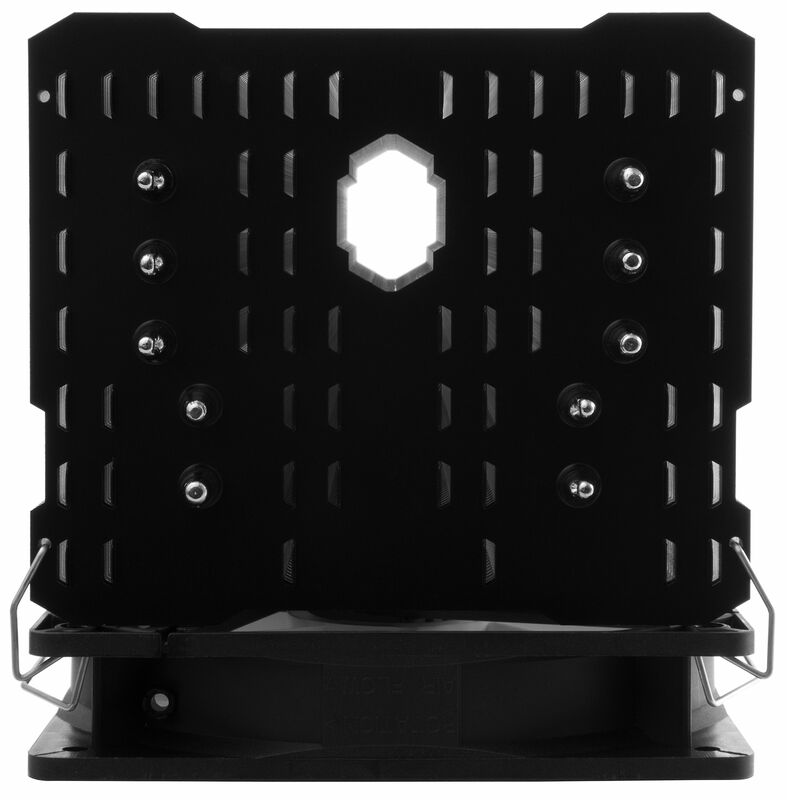 The heatsink is aligned to the rear of the PC case, which ensures that even when using RAM modules with high-rising heat spreaders no incompatibilities will arise despite the impressive dimensions of the heatsink. A temperature-controlled 120mm PWM fan is mounted with the included fan clips on the heatsink and provides a RPM range of 600 – 1300 (±15%) which produces a maximum air flow rate of around 46 CFM. 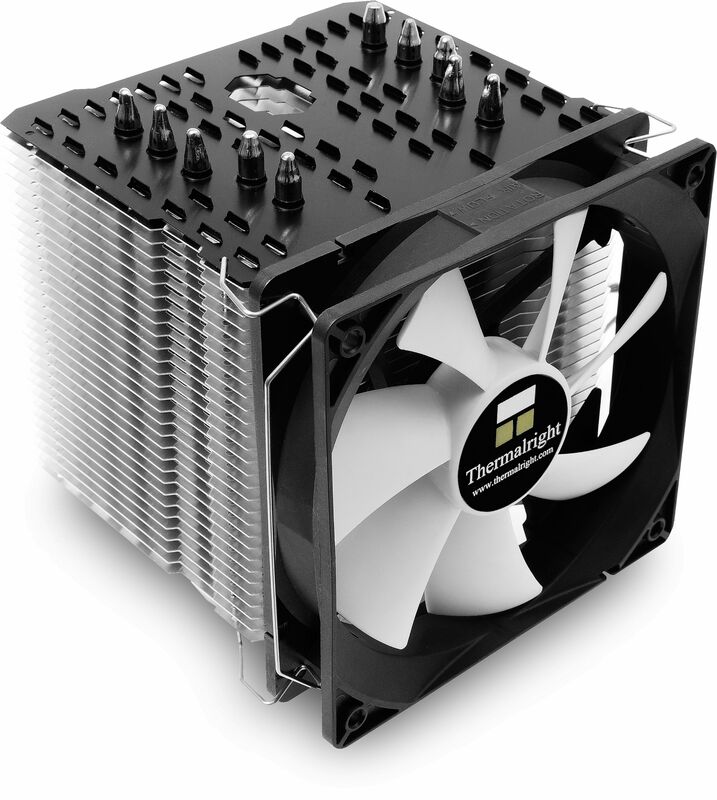 Due to the temperature-dependent control of the fan by the motherboard (if supported), the optimal ratio between volume and cooling capacity is achieved at all times, without the need of manual intervention. 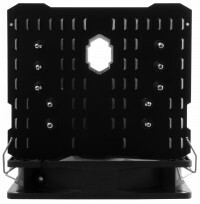 The Macho 120 Rev.A is a multiplatform-compatible cooler and includes mounting brackets for all common CPU sockets. The cooler can be used on Intel LGA775/1156/1366/1155/2011/1150/2011-3/1151 as well as AMD AM2/AM2+/AM3/AM3+/FM1/FM2/FM2+ motherboards. Included are self-adhesive anti-vibration pads for the decoupling the fan from the heatsink and Thermalright's legendary screwdriver! With this extra-long screwdriver, which has a magnetic tip, it is very easy to install the cooler even if the motherboard has already been mounted in the case (providing the chassis has a CPU mounting hole cutout on the motherboard tray).